However, I would like configure this in IIS Manager user interface, e.g. as an advanced setting of the application pool. Is there such a setting somewheere in IIS Manager? If you want to extend the length of the time-out setting, just change it from the default of 20 to however many minutes you want. You can also adjust the setting to 0 (zero) which effectively disables the timeout so that the application pool will never shut down due to being idle. However, I would like to know if I can set startMode="AlwaysRunning" in GUI. In IIS 7.5+, it is possible to do this through the GUI. Right click on the Application Pool -> Advanced Settings -> General -> Start Mode. Change that to "Always running" and it should accomplish what you are looking for. A web service or website never really get shutdown. The only thing that will get shut down or recycled is the application pool. 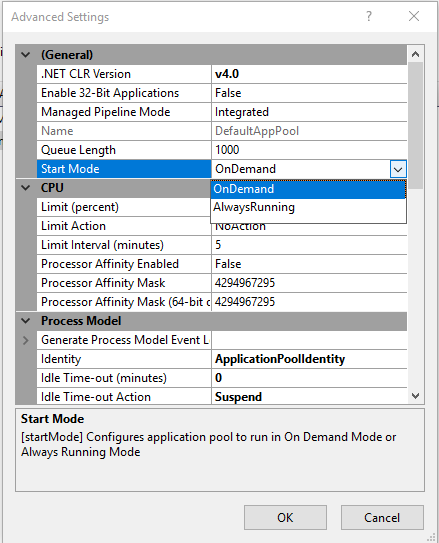 If you don't want the application pool to do that, you can set the advance property of the application pool in your IIS Manager.